Playphone’s After Hours Party at GDC 2016 is right around the corner! Cocos2d-x is a free and professional game-development toolkit, that enables developers to quickly create game content by simplifying it with straightforward GUI editors. Through our partnership with Cocos2d-x, exposure of your games to millions of gamers is now easier than ever. This seamless integration will allow you to increase engagement with your users and earn revenue in just a few simple steps. Learn more about what Cocos2d-x and Playphone can do for your mobile game today, http://psgn.co/IDpt. For questions regarding Cocos2d-x or Playphone, please contact us at devrelations@playphone.com. We are looking forward to meeting you at GDC 2016. Get 4X more installs in just 5 mins! The Playphone Game Store provides the ability for users to brag about their scores and achievements. Users can compete for the top spot and battle each other to win reward points. Games that have Leaderboards integrated get ~4X more installs as compared to the others and it takes only less than 5 minutes to integrate. 1. Login to http://developer.playphone.com and go to Your Games. 2. Select the game, go to the Leaderboard section for that game and follow the steps to add the Leaderboard. 3. Copy the Id that is automatically generated when you add the Leaderboard. You’ll need this in the next step. 4. Add the line of code below whenever the user gets a new score. This line should be added every time the user gets a new score and not just when they have a top score. * just when they have a top score. That’s it! Now all you need to do is build, test and submit the game to Playphone. So go ahead, boost your installs by adding Playphone Leaderboards in minutes! Check out the new Playpoints section in the Playphone Game Store! Our partnership with GungHo is very productive, and it’s opening up lots of amazing new opportunities for your games including a bigger presence in the world’s fastest growing gaming markets. First off, Playphone is reaching new gamers in Southeast Asia like no one has ever done before. According to NewZoo, Southeast Asia is the fastest growing gaming region in the world with over 125M gamers – of which, 48% are spending over $1.1 Billion annually. New Playphone stores are now live in Singapore and Indonesia, and new stores are coming soon to India and Taiwan. Playphone’s game stores are uniquely positioned to succeed in these exploding markets because of our strategic partnerships with local distributors and alternate payment providers, enabling easier access to games and preferred payment methods. 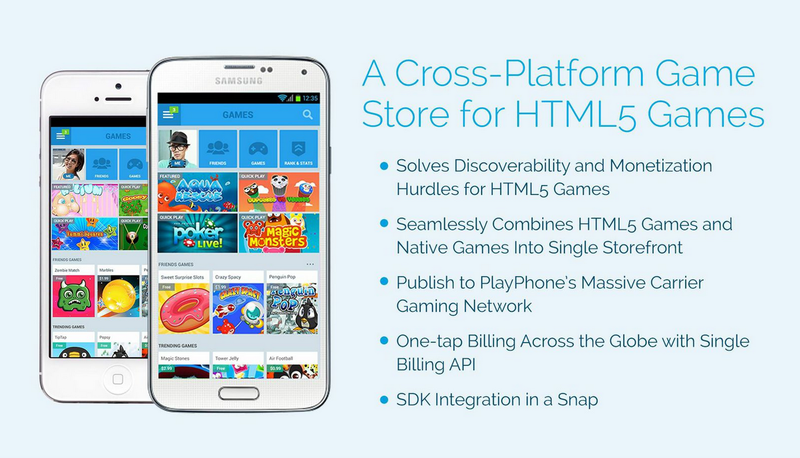 HTML5 Developers Can Now Display their Games with Native Android Games! Today we’re thrilled to announce PlayPhone’s support for HTML5 games across all Android devices, which include our very popular operator direct-billing capabilities for purchasing premium games and in-app purchases. Not only does this represent one of the largest single boosts in gaming exposure for HTML5 developers, Android gamers now have a level of access and discoverability that was previously impossible. We are excited to announce our latest round of developers that are coming to PlayPhone’s mobile gaming network. We have included the full release below, and we are looking forward to distributing your games to our subscribers! PlayPhone is at the heart of a revolution in mobile entertainment. PlayPhone’s next generation mobile gaming platform is experiencing accelerated adoption as carriers increasingly use the social game stores, global gaming network and network currency to instantly participate in the mobile app economy and regain revenues lost with launch of traditional app stores (iOS and Android). Social game stores are already live on Verizon, AT&T, Sprint, Claro, Vivo, TIM, SingTel, Telkomsel and messaging app, Tango, with more coming soon. PlayPhone Receives its First US Patent! 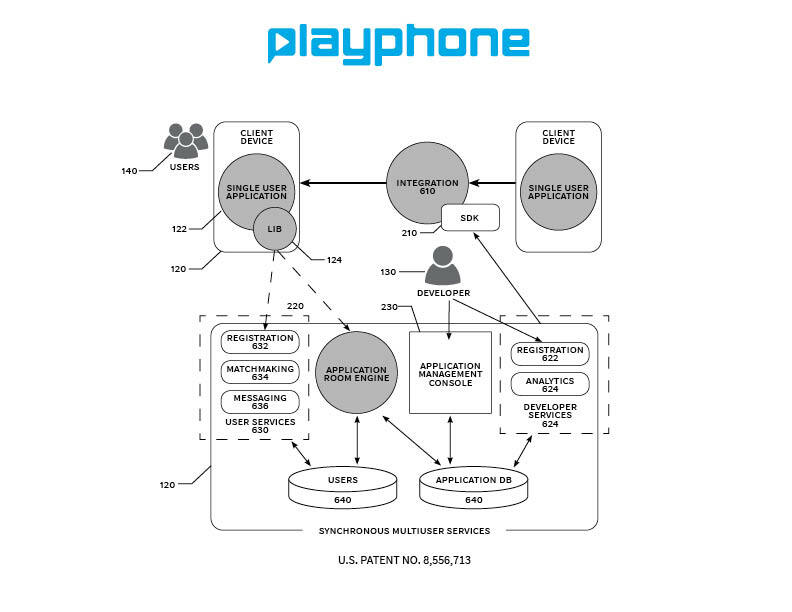 The U.S. Patent and Trademark Office has issued PlayPhone a key patent that covers real-time multiplayer gaming, a trend that is significantly on the rise worldwide. U.S. Patent No. 8,556,713 enables game developers to easily convert their single player game into a multiplayer game using PlayPhone’s cross-platform (iOS and Android) multiplayer gaming technology. It’s Here! The Amazing Cross-Platform Game Store for HTML5!